You might not know a lot about Iceland, and that’s okay. This tiny island country is perfectly fine flying under the radar. But if you’re looking for an amazing place, don’t overlook “The Land of Fire and Ice” as it’s come to be known. There are beaches, glaciers, mountains, lava fields, glacial rivers, lagoons, waterfalls, and just about everything else you’d ever want to take a picture of. A trip to Iceland will blow you, and your Instagram followers, completely away. Here are 15 reasons why it’s the ultimate Instagram trip. The Golden Circle is made up of the Pingvellir National Park, Haukadalur, and Gullfoss. It’s only around 40 minutes from Reykjavik. At the park, you can witness two tectonic plates colliding. Haukadalur features erupting geysers. The Gullfoss waterfall is a sight to be seen. Earlier in the day is the best time to visit the Golden Circle, before it gets too crowded with tourists who could potentially block your shot. If you’re looking for a good company to take you to Iceland, On The Go Tours has a great tour of the Golden Circle. Would a trip to Iceland be complete without posting a picture of the Northern Lights? Guided trips with The Aurora Zone allow you to learn more about the history and culture of the country while taking in the incredibly colorful lights. The auroras are famous for a reason, you’ll never look at the night sky the same way again after witnessing the magic of this natural phenomenon. Reynisfjara is a beautiful black pebble beach with an amazing pyramid shaped cliff of basalt columns that look like they could be featured in a museum. A two and a half hour drive from Reykjavik, it’s well worth the trip. There are also remarkable rock formations out in the ocean. It’s an extremely photogenic place that deserves a spot on your Instagram feed. Check out more photos like the picture above on Guide to Iceland. Warning: their page is wanderlust-inducing. The Solheimasandur Plane Crash is a wreck left behind from 1973. It’s eerie yet cool and is next to the sea, which is why so many people travel to visit and photograph it. Everyone involved in the crash survived, so the plane is not a memorial, yet the site remains as a reminder. If you enjoy hiking, the walk from the main road to the plane is about an hour long, this is how many people get to the wreckage. Iceland’s Blue Lagoon is one of the wonders of the world and one of the most Instagram-worthy spots ever. It’s a geothermal spa offering in-water massages, naturally created silica mud and algae masks, and 9 million liters of natural hot water that has been known to help with numerous conditions, including psoriasis. There are accommodations on site and an array of food and drink options to choose from. Icelandic-owned and operated Dive Silfra offers snorkeling and diving tours in the Silfra fissure, between two tectonic plates, that are both fun and eco-friendly. They’re proud of their industry-leading standards when it comes to safety. Their guides are underwater experts who will ensure your experience will be something you remember for the rest of your life, so be sure to bring an underwater camera. Halldorskaffi is a popular restaurant, serving up plates that are as beautiful as they are delicious. Try some traditional Icelandic dishes, after taking pictures of the food, of course. The menu features cured local lamb from their family farm, salad with dilled salmon and a balsamic glaze, bacon-wrapped dates, grilled salmon, and warm rhubarb cake. If you’re the adventurous type, you’ll love snowmobiling over a breathtaking glacier with Arcanum Glacier Tours. Embark on two hour tours, including your clothing and helmets, to get your adrenaline pumping as you drive on top of an ice cap covering one of the country’s largest volcanoes, Katla. Take in the scenery and explore the wilderness, with plenty of opportunities for photography. The only thing you need is a valid driver’s license. Kerid Crater Lake, otherwise known as Kerið, is a volcanic crater lake in southern Iceland. Formed when the magma in the center depleted itself and the chamber beneath the crater caved in on itself, the lake is a unique sight in a unique country. The walls surrounding the bright blue water are made up of rare red volcanic rock and moss. It’s approximately 180 feet deep and 560 feet wide. Bæjarins Beztu Pylsur is a famous hot dog stand whose name literally translates to “The best hot dog in town” in English, so you know they’re serving up some good stuff. Open since 1937, thousands of people have eaten at this spot in downtown Reykjavik, including former president of the United States Bill Clinton and the band members of Metallica. The Leiðarendi Lava Tube, a 3,000-foot long lava tube created around two thousand years ago, is nicknamed the “volcanic veins” for a reason. The twisty tunnel is the color of blood. Tour guides will bring you to a section that is so pitch black, it is known as “the world’s darkest place”. Yes, the tube is a little spooky, but it’s also bound to garner a lot of likes on social media. The Seljalandsfoss Skogafoss waterfalls both come in at about 200 feet tall. Easy to climb and boating many different viewpoints, they’re incredibly fun to explore. Bring your camera or phone because you’re not going to want to miss out on taking pictures here, but be sure to have waterproof cases and waterproof clothing, you’re almost guaranteed to get wet. You know pictures of animals always do well on Instagram, and luckily Iceland has some of the most beautiful creatures in the world, including the Icelandic horses. They have short legs and side-swept bangs and are seriously adorable. May 1st is the International Day of the Icelandic Horse. There’s even a hashtag for these beauties; #horsesoficeland. Hallgrímskirkja is the tallest building in Iceland, being 244 feet tall. Located in the center of Reykjavik, Hallgrímskirkja is a church boasting an organ, an elevator, a bell tower, and stained glass windows. The reason it was made so tall was in case it needed to be used for the transmission of radio signals. The best part? The views from the top of the tower. Kirkjufellsfoss in Iceland. The Iconic landscape with the famouse mountain. . . @d.arkhipov . . #iceland #icelandnature #kirkjufell #waterfall #cataratas . . The Snæfellsnes peninsula is located in western Iceland. There are many national sites in the area, including the Snæfellsjökull volcano, Arnarstapi, Hellnar, and Kirkjufell. 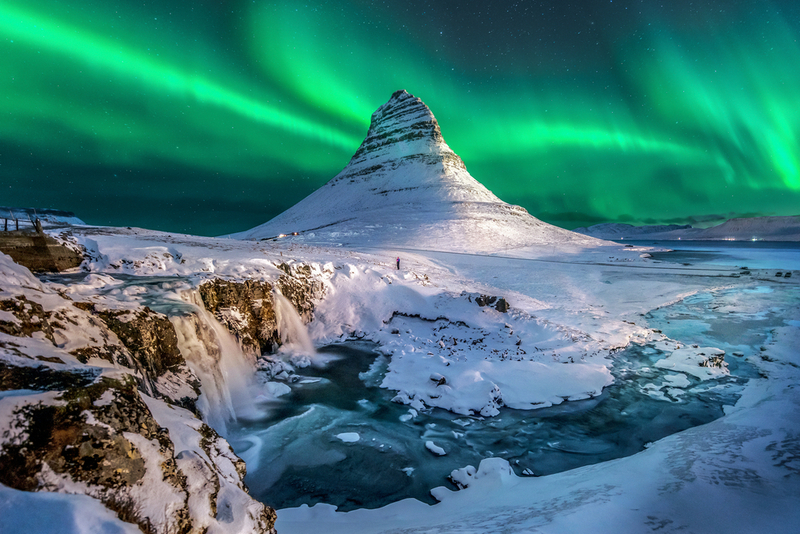 Kirkjufell is one of the most photographed mountains in the country, so get your camera ready. The sustainable small towns in the peninsula are filled with friendly people and fun things to do.